Flow cytometric analysis of U-2 OS cells, untreated (blue) or treated with DMOG (1 mM, 6 hr; green), using HIF-1α (D1S7W) XP® Rabbit mAb (PE Conjugate) (solid lines) or concentration-matched Rabbit (DA1E) mAb IgG XP® Isotype control (PE Conjugate) #5742 (dashed lines). 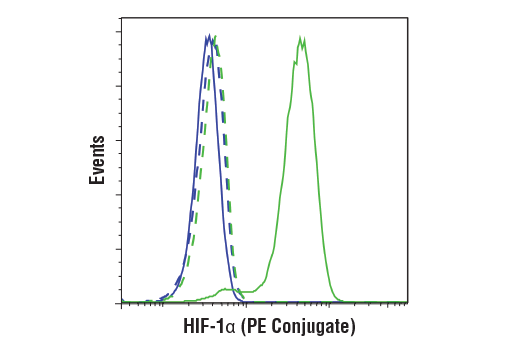 HIF-1α (D1S7W) XP® Rabbit mAb (PE Conjugate) recognizes endogenous levels of total HIF-1α protein. This antibody does not cross-react with HIF-2α protein. Monoclonal antibody is produced by immunizing animals with a synthetic peptide corresponding to residues surrounding Leu478 of human HIF-1α protein. This Cell Signaling Technology antibody is conjugated to phycoerythrin (PE) and tested in-house for direct flow cytometric analysis in human cells. This antibody is expected to exhibit the same species cross-reactivity as the unconjugated HIF-1α (D1S7W) XP® Rabbit mAb #36169. Hypoxia-inducible factor 1 (HIF1) is a heterodimeric transcription factor that plays a critical role in the cellular response to hypoxia (1). The HIF1 complex consists of two subunits, HIF-1α and HIF-1β, which are basic helix-loop-helix proteins of the PAS (Per, ARNT, Sim) family (2). HIF1 regulates the transcription of a broad range of genes that facilitate responses to the hypoxic environment, including genes regulating angiogenesis, erythropoiesis, cell cycle, metabolism, and apoptosis. The widely expressed HIF-1α is typically degraded rapidly in normoxic cells by the ubiquitin/proteasomal pathway. Under normoxic conditions, HIF-1α is proline hydroxylated leading to a conformational change that promotes binding to the von Hippel Lindau protein (VHL) E3 ligase complex; ubiquitination and proteasomal degradation follows (3,4). Both hypoxic conditions and chemical hydroxylase inhibitors (such as desferrioxamine and cobalt) inhibit HIF-1α degradation and lead to its stabilization. In addition, HIF-1α can be induced in an oxygen-independent manner by various cytokines through the PI3K-AKT-mTOR pathway (5-7). HIF-1β is also known as AhR nuclear translocator (ARNT) due to its ability to partner with the aryl hydrocarbon receptor (AhR) to form a heterodimeric transcription factor complex (8). Together with AhR, HIF-1β plays an important role in xenobiotics metabolism (8). In addition, a chromosomal translocation leading to a TEL-ARNT fusion protein is associated with acute myeloblastic leukemia (9). Studies also found that ARNT/HIF-1β expression levels decrease significantly in pancreatic islets from patients with type 2 diabetes, suggesting that HIF-1β plays an important role in pancreatic β-cell function (10). Sharp, F.R. and Bernaudin, M. (2004) Nat Rev Neurosci 5, 437-48. Wang, G.L. et al. (1995) Proc Natl Acad Sci U S A 92, 5510-4. Jaakkola, P. et al. (2001) Science 292, 468-72. Maxwell, P.H. et al. (1999) Nature 399, 271-5. Fukuda, R. et al. (2002) J Biol Chem 277, 38205-11. Jiang, B.H. et al. (2001) Cell Growth Differ 12, 363-9. Laughner, E. et al. (2001) Mol Cell Biol 21, 3995-4004. Walisser, J.A. et al. (2004) Proc Natl Acad Sci U S A 101, 16677-82. Salomon-Nguyen, F. et al. (2000) Proc Natl Acad Sci U S A 97, 6757-62. Gunton, J.E. et al. (2005) Cell 122, 337-49.